Drama/Musical, /Argentina, 1998, 115 min. Synopsis Film director Mario Suarez is left by his wife. 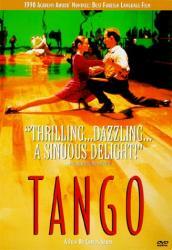 Throwing himself into his work, he decides to make a film on the tango. While casting, he meets Elena Flores, an amazing tango dancer, and the two fall in love. But Elena is the mistress of Angelo, the main investor in the film, and a man it is prudent not to anger. As their love affair becomes more passionate, it also becomes more dangerous.